Timberland has been a popular brand for approximately a century. The company uses its New England heritage as the basis of its product design and has succeeded in creating products that have been positively received by all. The chances are that you have heard of this brand with respect to its footwear portfolios. After all, Timberland is known for its quality boots. However, its product line is not merely limited to such items and includes luggage as well. Most of the Timberland luggage reviews you will find online are positive and there is a good reason for that. Timberland is producing quality luggage which fits most shoppers needs. You can buy individual products or a set to save money, Timberland has it all. Out of all the options available for you to choose from, we have chosen the five offers from Timberland which we believe are the best and will serve you for many years to come. For those of you who are planning to go on a long vacation, you might find this 30-inch wheeled duffle to be an excellent choice. If you feel you are better off with a smaller bag than this, you will be happy to know that the bag is available in 26 and 22-inch sizes as well. When you are going on a trip, the last thing you want to be stuck with is a huge bag which is a hassle to carry. Timberland manages to take care of this issue by accompanying the duffle with in-line skate wheels. These wheels allow for ease in transportability and maneuvering the product. This feature makes this Twin Mountain duffle to be immensely practical to use. Moreover, many individuals wish for aesthetics even in their bags. The design of the product is stylish yet sophisticated. We found the contrast between the grey exterior and the orange trim to be pleasing to the eye. The handle of the luggage features a push-button system to allow for an apt way of securely locking the bag. Webbed attachment points are added to the bag to offer users the autonomy of connecting the duffle with additional gears. The dimensions are 30″ L x 16″ W x 12″ D.
The product itself has a low weight of 11 pounds. Carry handles as well as the side handles accompany the product. Therefore, you can carry the duffle as per your liking. Apart from the fact that this Twin Mountain duffle is not as durable as we would like it to be, the product manages to tick all the right boxes. Some occasions call for the need of a small bag, while others require you to pack a lot of luggage. Now, finding such varying sizes can be a hassle. 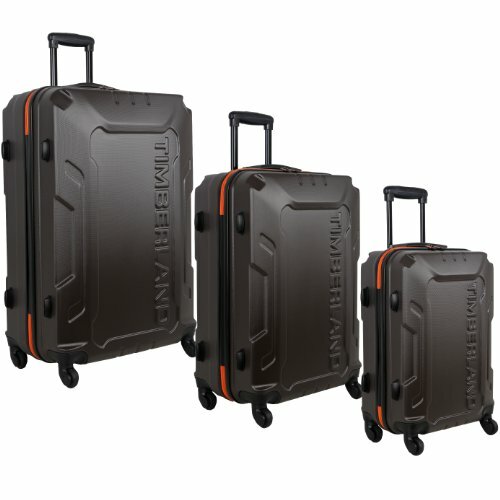 Timberland ensures that such is not the case by including three sets of luggage bags, each of which is of a different size. No two people are the same. While some prefer to use the carry handle of a luggage to transport it from one place to another, others feel at ease using the side handles. Some bags do not offer both these components that act as an inconvenience for many. However, Timberland Boscawen is not one of them. The product is equipped with both handles to ensure the comfort of users. Moreover, the interiors of the luggage are lined completely. This guarantees the durability of the product as well as makes sure that your possessions remain safe when in the bag. On top of this feature, Boscawen is equipped with valet straps that can be adjusted. This is ideal for those who have a habit of filling a bag to the brim. Boscawen does not include PVC. The product is equipped with four wheels, each of which can spin to a 360-degree angle. The trolley handles come with a locking mechanism for security. The sizes of the bags in the set are 28 inches, 25 inches, and 21 inches. 28″ x 20″ x 12″ for the 28-inch bag with a weight of 10.5 lbs. 25″ x 17″ x 11″ for the 25-inch bag with a weight of 8.75 lbs. 21″ x 14″ x 9″ for the 21-inch bag with a weight of 6.5 lbs. We found the carry handle to be flimsy, but when it comes to space and quality of the bags, this luggage set is exemplary. Lightweight luggage sets can be lifesavers. They make the trip so much better since you are not required to carry an extra load on your trip. Timberland has been able to fulfill this need of customers via the Hampton Falls 3-Piece Luggage Set. This luggage set comes with all the classic Timberland features. It has in-line skate wheels for easy rolling and a zip closure for secure packing of your luggage. However, this product takes it further up a notch by including feet which are molded in a way to help the luggage stand in an upright position. Therefore, you can bid goodbye to the hassle of taking care of your toppling bags. Moreover, the duffle includes an interior frame which is collapsible to create more room. For those of you who love to meticulously organize your luggage, you will find the two-compartment divide to be excellent. The pull handles are made of aluminum telescopic handles that allow for a comfortable grip. The product is equipped with a padded compartment for your laptop as well as an additional front pocket. The set includes two duffle bags with 21-inch and 30-inch sizes respectively and a backpack. 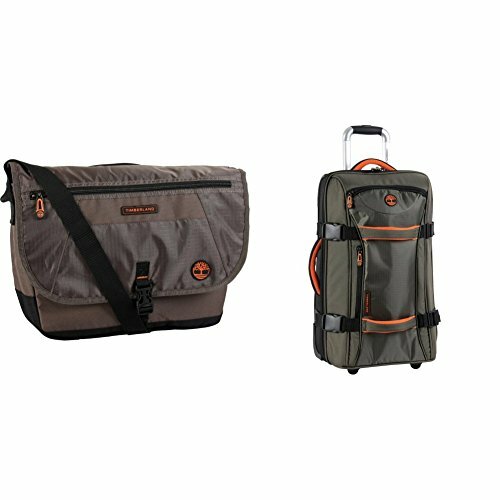 Whether it be quality or versatility of use, this set is the perfect luggage set to have for a variety of purposes which can be seen from the raving Timberland luggage reviews available. Are you looking for a matching carry-on and luggage set? 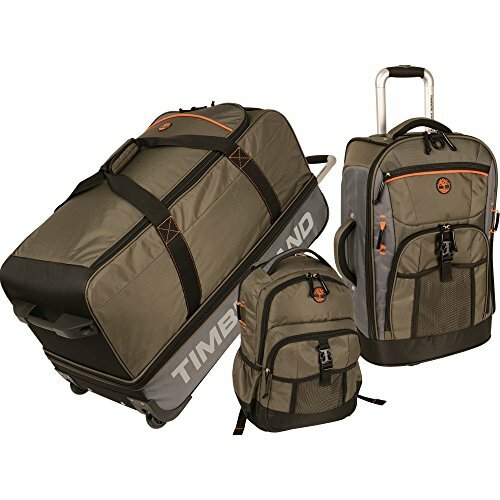 Well, the Timberland Twin Mountain has managed to provide users with both a wheeled duffle and a quality carry-on. The best thing about this two-piece set is the inclusion of water-resistant bags. The worst nightmares of most travelers are spilling something on their carry-ons. After all, accidents can happen, especially in long flights and rough handling. This Timberland luggage is made of a material that is known to be water-resistant. This increases the durability of the products as well as the security they provide to the enclosed items. Moreover, for those of you who wish to reduce their role in global warming and other environmentally destructive acts, you will find that this product will help you do so. The fact that it is made of recycled material means that Timberland is playing its part in sustainable development. The included duffle has a size of 22 inches and contains wheels for easy maneuvering. The carry-on comes with a buckle and a foldable flap. The shoulder strap of the carry-on can be adjusted as per your liking. The carry-on has a very simple construction, which might not be enough for some people. If you are fine with using a basic luggage set, you will be satisfied with the performance of the product. This might be the ideal purchase option for those who are going on a family vacation. This four-piece set is both stylish and durable. The set includes two suitcases, a carry-on, and a backpack. Hence, it is a holistic package which allows you to be prepared for all types of vacations or work travels. Each bag is equipped with Timberland’s classic contrasting trim design which gives it an elegant and unique look. The interior side of the products are lined with quality material, and each of them features pockets made out of mesh as well as valet straps that are adjustable. The telescoping trolley handles and the lock system are in this set as well, each of which plays an integral role in providing comfort to users. The suitcases are equipped with wheels, while the carry-on features an adjustable strap. You will find exterior pockets with zippers in all of the products in this set. You can also link more bags to the suitcases with the help of the additional strap. The sizes of the suitcase are 26 and 39 inches, while the carry-on bag measures 21 inches. We found the suitcases included in the set to be quite heavy. 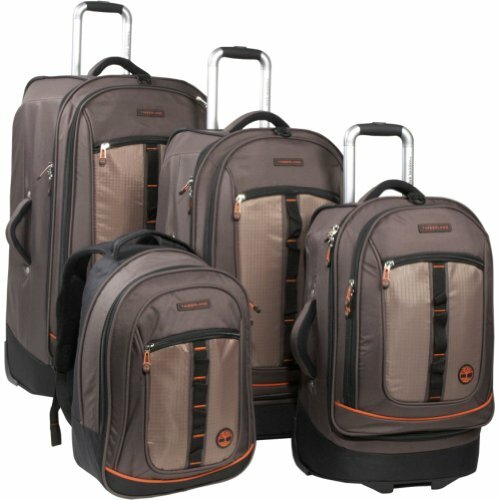 However, this doesn’t take away from the fact that the luggage set is durable and practical to use. Timberland is known for producing quality luggage, and the five offers listed above are an example of this. 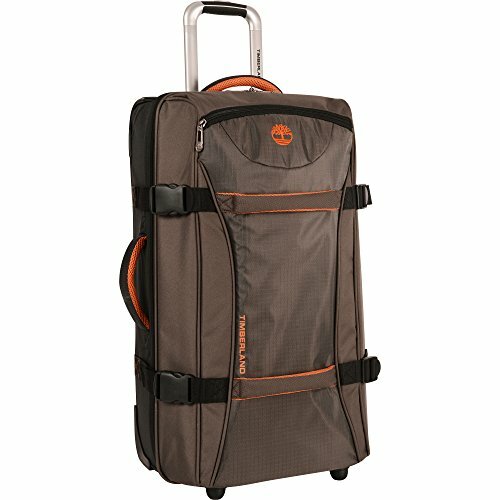 While most Timberland luggage reviews are positive, you will still find an odd negative one out there. But do not worry, you are covered with a great warranty if something ever happens to your Timberland luggage. Out of the 5 offers, in our Timberland luggage review, we found the Timberland Luggage Jay Peak Four-Piece Set to be the best one due to the array of products it includes and the fact that it provides these products at an affordable price. If you choose Timberland for your luggage, you won’t be disappointed. You may also be interested in Nicole Miller and Tommy Bahama luggage reviews.